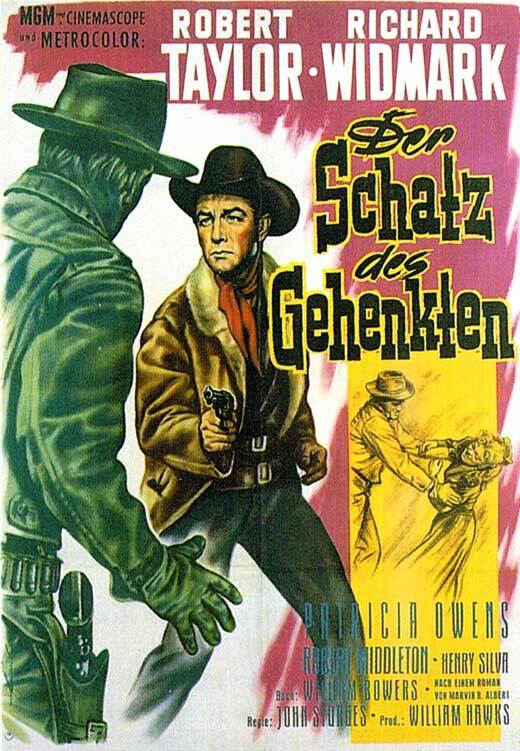 The enigmatic title of this treasure-hunting noir western set in modern times (ca. 1950) refers to a large area of dunes that move around in strong winds. An 1852 wagon train supposed to have been full of gold was been lost there, and in a back room card game in Calexico, young Johnny (Jerome Courtland) refers to having seen what might be a line of wagons out in the sand. Old Willy (grizzled former dentist Edgar Buchanan) supplies the legend, and it is determined that everybody in the room must go, lest anybody staying behind later follow with his own search party and cut them out. They are soon joined by Chris Jackson (Ella Raines), who works at a local lunch counter and has romantic history with two members of the group. 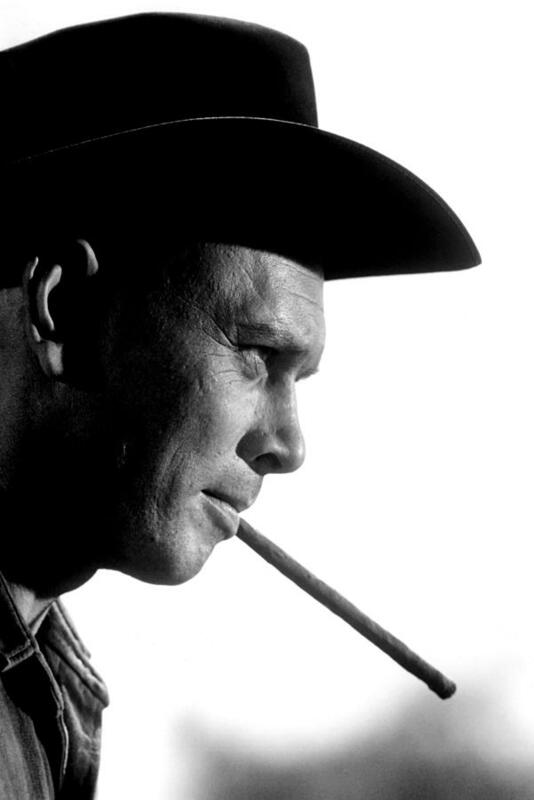 Aside from Old Willy, the most experienced hand is Jim Carey (Randolph Scott), a rancher and horse breeder, who brings along a mare he expects to foal at any time. He supplies the expedition with horses, wrangled by his Indian hand Cleve (Charles Stevens). Chris and Jim were a romantic item before she left him for rodeo rider/gambler Shep/Dave (William Bishop). Shep in turn abandoned her in the rain in Denver. 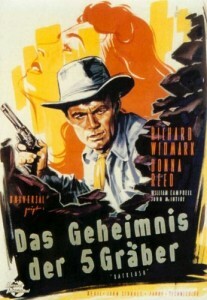 Jim Carey (Randolph Scott) is the center, figuratively and visually, of the group of gold hunters. Frazee (John Ireland) is a private detective who was pursuing Shep but is now more interested in gold. He has a gun and a heliograph, with which he signals a confederate in the foothills. Bits of backstory are told in flashback, such as the fact that Shep had been in a card game in Denver that resulted in an accidental death, for which he is now wanted by the law. That’s why he left Chris in Denver. Johnny sees Frazee burying something and jumps him; he is shot by Frazee and initially thought to be paralyzed. 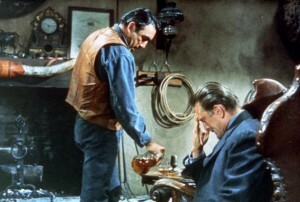 Chris insists that Jim get Johnny to a doctor, but Jim can’t leave his mare and thinks that Johnny won’t make it anyway. He doesn’t, although he supplies a couple more bits of information before his demise. [Spoilers follow.] Old Willy discovers a wagon, giving the group new energy. 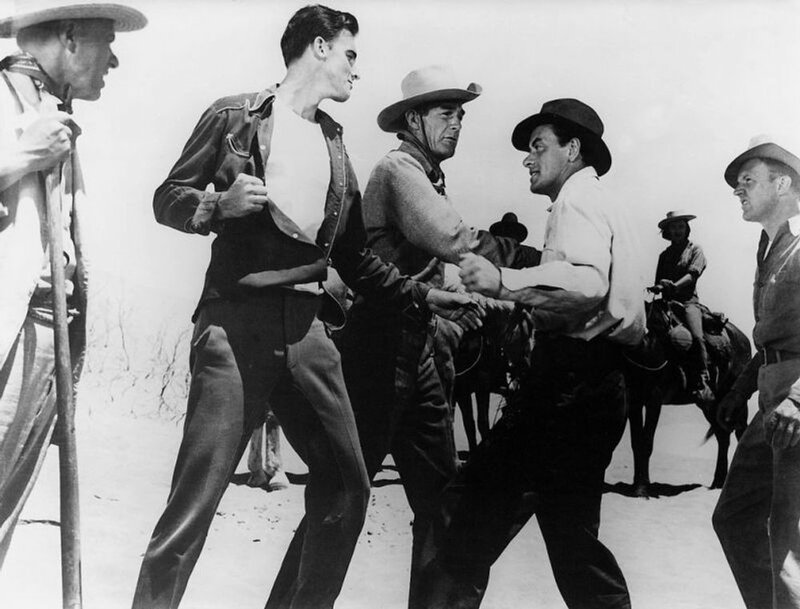 But there’s no gold in the wagon, and the band is hit by a sand storm, during which Frazee battles Shep, Chalk (Arthur Kennedy) and Jim with shovels and fists before Chalk shoots Frazee with his own gun. Jim scrambles to round up the scattered horses in the storm, while the others seek cover. When the storm passes, the wagon train stands revealed, but with no gold. Shep takes off to turn himself in and sort things out; Jim gives Chris one of the few remaining horses to follow him. And he forces Old Willy to reveal that he has in fact found $10,000 in gold, which he will have to split with the survivors. Jim takes the remaining horse and the new foal, saying that he will send horses for them. 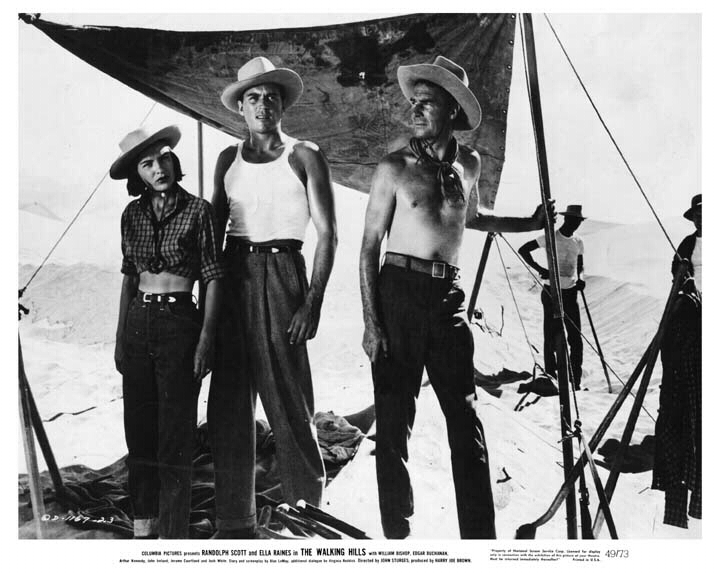 Treasure-seekers and romantic triangle Chris (Ella Raines), Shep/Dave (William Bishop) and a shirtless Jim Carey (Randolph Scott). The cast is very good. Randolph Scott was the biggest star at the time, and he is the moral center of the movie, although he doesn’t seem all that moral at the start. He’s in good physical shape for a man in his 50s, as his shirtless scenes remind us (for more of those, see him in Carson City). His strong, taciturn role here reminds us of his work ten years later with director Budd Boetticher. Sultry Ella Raines is good as Chris; this may have been the peak of her modest movie career, though. John Ireland was also at the early peak of his long movie and television career following Red River, My Darling Clementine and I Shot Jesse James and before All the King’s Men. Look for Scott and Ireland together again the same year in The Doolins of Oklahoma, a more conventional western. William Bishop was fine in this, but did not have a particularly notable career before his early death at 41. Arthur Kennedy doesn’t have much to do or much camera time. For Edgar Buchanan in another role as a grizzled gold seeker about this time, see him with Glenn Ford in Lust for Gold. Geronimo’s grandson Charles Stevens gets more screen time here than he usually did, and he looks authentic. Fights break out, mostly centering on private investigator Frazee (John Ireland). Surprisingly for a relatively short film, this includes a couple of musical interludes by bluesman Josh Smith. Note the camera angles used by director Sturges during those interludes to provide visual interest and prevent things from becoming too static during the songs. The birth of a foal in the desert provides a symbol of hope and renewal when things are going badly. 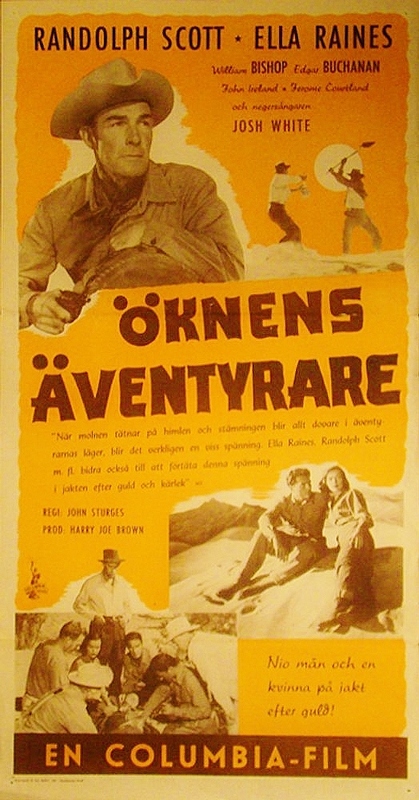 The classic Treasure of the Sierra Madre had come out the previous year (1948), and this was obviously influenced by the success of that film. 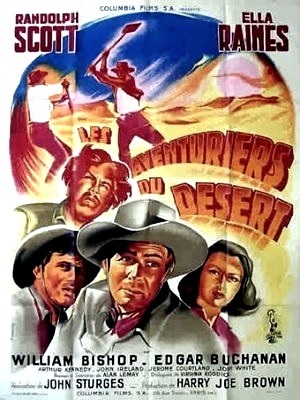 It was shot in Death Valley and Lone Pine in beautiful black and white by Charles Lawton, Jr., who later worked with producer Harry Joe Brown and Randolph Scott several more times on the Boetticher westerns. The sandstorm scenes are particularly effective. He also worked with eminent western directors Delmer Daves, including the marvelously shot 3:10 to Yuma, and John Ford. This entry was posted in Westerns Worth Watching and tagged John Ireland, John Sturges, Modern West, Randolph Scott, Westerns Noir on January 24, 2016 by Nicholas Chennault. 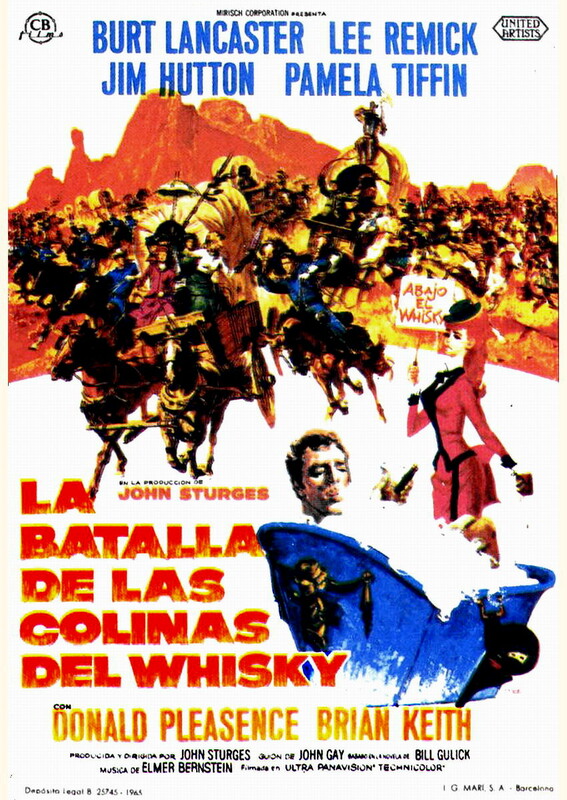 Director John Sturges was in the middle of a pretty good run of westerns. 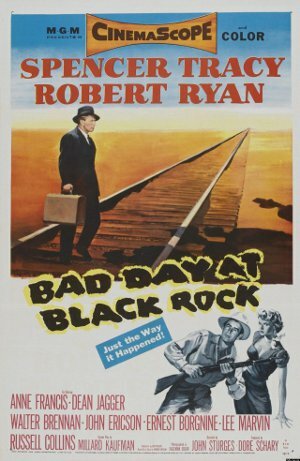 He made this just after Bad Day at Black Rock and just before Gunfight at the OK Corral, The Law and Jake Wade (also starring Widmark, but that time as a psychotic bad guy) and Last Train to Gun Hill. This is a step below those, but it’s still quite watchable. This one opens with a rider in black, who turns out to be Karyl Orton (Donna Reed) in a curiously flat-crowned had, obviously made for women. She encounters Jim Slater (Richard Widmark) digging at the site in Gila Valley, Arizona Territory, where Apaches had killed five men. Slater, a Texan from Nacogdoches and veteran of the Civil War who never knew his father, thinks that his father was one of the five. And he’s looking for a sixth man who escaped the Indians with $60,000 in gold. Orton’s husband, also a Confederate veteran whom she hasn’t seen since the war, was in the group, too. While they’re getting to know each other, somebody starts shooting at them from the rocks above. Slater outflanks the shooter and kills him when he won’t put down his gun; Slater is obviously both good with a gun and doesn’t back down from a challenge or from authority. The dead man has a badge that says he’s a deputy sheriff in nearby Silver City, and they take him back there. The sheriff, somewhat hostile, says that the dead deputy was named Welker. His brother was one of those killed at Gila Valley, and he has two more brothers who are both good with guns and of bad character. Slater isn’t sure he can trust Orton much, and they seem to go their own ways. They move on to Tucson separately, where they’re both looking for a Sgt. George Lake, who was in charge of the detail that buried the victims in Gila Valley. It turns out he’s at Benton’s trading post, and when they get there, it’s under siege by Apaches. Lake (Barton MacLane) obviously has other things on his mind and isn’t interested in rehashing Gila Valley. The Apaches run off the whites’ horses, and Lake and Slater figure the only way out is to return the favor and escape with the horses still hitched to the stagecoach. 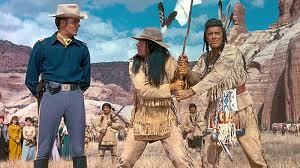 They carry out that mission and develop more of a rapport, getting away with a couple of Indian horses. Lake, however, is badly wounded. Before he dies, he tells Slater that three of the bodies were identifiable (one was a Welker) and of the two that were not, one was missing a left hand from an old injury. The sixth man, the one who got away, was riding a horse with Major Carson’s Texas brand. Lake knew, but didn’t think much of, Orton’s husband Paul. Back in Tucson, the nasty Welker brothers Jeff (Robert Wilke) and Tony (Harry Morgan) commandeer Orton in a hotel, looking for Slater. As Jeff takes her upstairs in a saloon, Slater walks in and Orton identifies him to them. He gets both Jeff and Tony, but is wounded himself in the left shoulder and leaves town. Orton follows him and doctors his wound. She’s pretty casual about taking off her shirt to use as a not-terribly-effective bandage, and she admits that her Confederate husband never came back because he heard that she was “fraternizing” with the enemy Yankees in Atlanta. She and Slater come to a rough understanding. As they approach Carson’s ranch the next day, they are stopped by two of his men, one of whom, Johnny Cool (William Campbell), clearly fancies himself as a gunslinger, in the stereotypical black leather and all. Carson and other big ranchers are about to move against Jim Bonniwell (John McIntire), a rancher-rustler who has recently taken to hiring gunmen and being more overt in his stealing of cattle. While at Carson’s ranch, they learn that Carson’s nephew was the corpse with the missing hand. As Carson’s small army prepares to ride into town early the next morning Slater and Orton head for town, to find that Johnny Cool is apparently working for Bonniwell and still wants to kill Slater. Bonniwell stops him, and rides out; Slater is put in jail by the local sheriff, who thinks Slater’s working for Bonniwell. Tony Welker shows up, still looking for Slater, and antagonizes Johnny Cool, who has decided he wants Orton. Cool wins the shootout with Welker, reducing by one the number of people who want to kill Slater. Even earlier than Carson, Bonniwell brings his own smaller army into town the next morning to set up an ambush for Carson. He kills the sheriff, whom he correctly assumes to be on Carson’s side, and he lets Slater out, discovering in the process that he is Slater’s father. Johnny Cool won’t be dissuaded from trying to kill Slater, and Bonniwell lends Slater his gun. Slater wins; he’s not as showy as Cool, but he’s faster. It’s part of his genetic legacy from Bonniwell, apoparently. Slater (Richard Widmark) meets his father (John McIntire). As the ambush develops, Slater warns Carson by firing shots and Bonniwell tries to kill Slater. 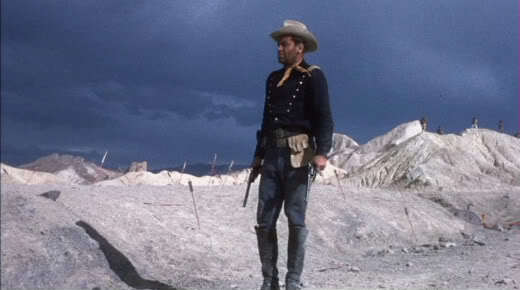 As the final shootout between father and son develops (with Bonniwell cheating), Bonniwell is shot in the back by one of the Carson band. And Slater and Orton ride off together with their dark pasts. Widmark and McIntire are good, with McIntire playing much like his role in The Far Country. Reed isn’t a natural at westerns (this is the last of her eight westerns), but she’s fine here. Neither Widmark (supposedly from Texas) nor Reed (supposedly from Atlanta) has an accent that relates to their origins, but that’s just as well. 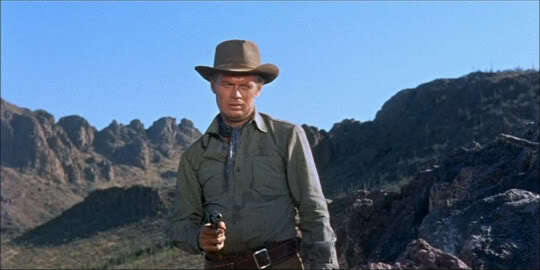 When Widmark tried a southern accent in Alvarez Kelly, it wasn’t terribly persuasive. There are geographical oddities: the trip from Arizona Territory to Texas seems to take no time at all. Lots of ins and outs for just 84 minutes. From a book by Frank Gruber, the screenwriter was Borden Chase. In color, shot partially in Old Tucson. 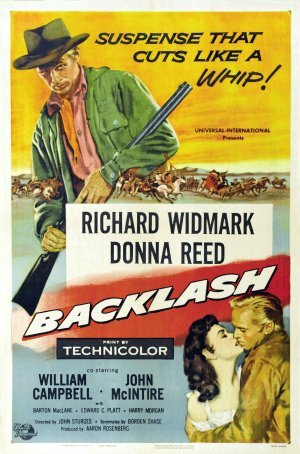 This entry was posted in Westerns Worth Watching and tagged Donna Reed, John McIntire, John Sturges, Native Americans (Indians), Outlaw Gangs, Richard Widmark on March 7, 2014 by Nicholas Chennault. 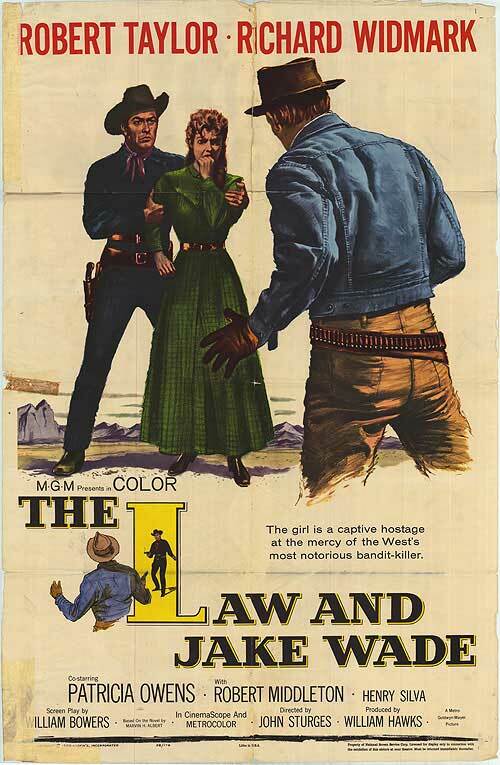 One of the last films directed by John Sturges, with a screenplay written by Elmore Leonard. The plot is similar to that of Valdez is Coming, which was also based on a novel by Leonard and made about the same time. This is more predictable than Valdez, mostly by having Clint Eastwood playing Clint Eastwood in the title role but also by having a less organic plot. This story is set in pre-statehood New Mexico Territory in 1912, starting in the small town of Sinola. 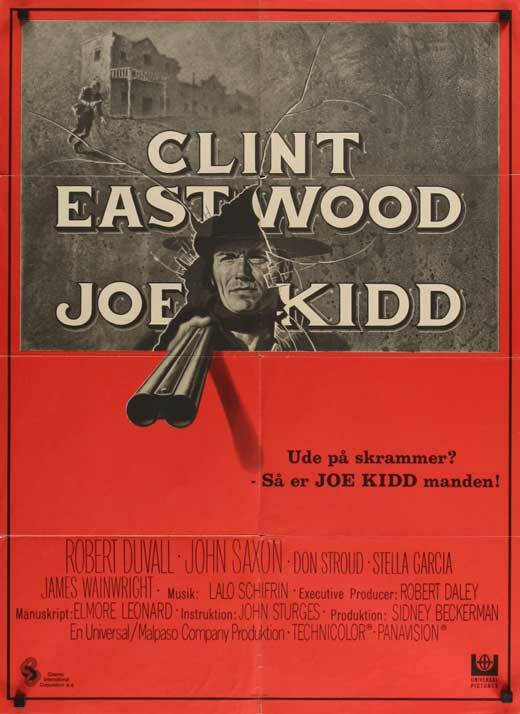 Joe Kidd (Eastwood) is a former bounty hunter and tracker hired by big rancher Frank Harlan (Robert Duvall) to help his band of well-armed thugs find Luis Chama (John Saxon), a local Latino bandit chieftain/freedom fighter/land-reform agitator. As Harlan shows himself to be merciless and his thugs brutalize those of Latino descent they come across, Kidd realizes his mistake. He’s fired by Harlan before he can quit, and manages to escape with Chama’s girlfriend Helen Sanchez (Stella Garcia), only to find that Chama is not as noble as the native populace would like to believe, either. There’s a great chase through the mountains, as Kidd hunts Harlan, who’s hunting Chama and Kidd. Joe Kidd (Clint Eastwood) uses an unusual modern pistol to defend himself and Helen Sanchez (Stella Garcia). Kidd leads Harlan and his men back to town, where the fight concludes in a not-terribly-believable fight, with lots of bullets flying and an improbable train crash. Interesting elements: (a) The brick-red pants Eastwood wears throughout the movie. This must be an early 1970s thing. Compare them with the red pants worn by Jim Brown in Take a Hard Ride, for example. (b) The specialized “modern” firearms used by Harlan’s men, including the Mauser C96 pistol-with-a-stock (1896) used by Lamarr Sims (Don Stroud) and the long-range rifle–a Remington-Keene sporter (1880)–used by Olin Mingo (James Wainwright). Special care is also shown with Frank Harlan’s Custom Savage 99 (1899) and Joe Kidd’s Cased Ross Rifle model M-10 (1910). Apparently Elmore Leonard was behind the scrupulousness about period weaponry. (c) Harlan’s repeated deliberate mispronunciation of Chama’s name (as “Louis Chayma”). It gets irritating, as perhaps it’s meant to do. Set in 1912 New Mexico, and shot at Lone Pine and Old Tucson. 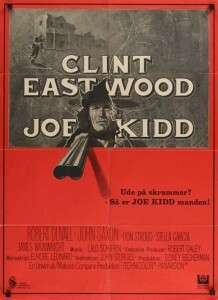 This is not one of Eastwood’s best, or Sturges’, although it’s watchable. 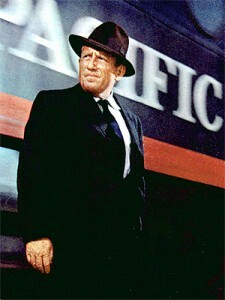 Apparently director Sturges commented in 1978, “There are a lot of holes in Joe Kidd–some in the script that were never fixed and some resulting from cuts made because scenes just didn’t play.” The Harlan thugs are too unrelievedly bad and despicable, and the plot is a bit outlandish (the big finale involving a train and a not-well-choreographed shootout). With the Sturges-Eastwood-Duvall-Leonard team, one hopes this would be better than it turns out to be. Not a long movie, at 88 minutes. The score is by Lalo Schifrin, who did the memorable Mission: Impossible theme. For another western interested in post-frontier technology and weaponry, see Big Jake, set in 1909 and made about the same time as this one. This entry was posted in Westerns Worth Watching and tagged Clint Eastwood, Elmore Leonard, John Sturges, Manhunts, Robert Duvall on January 24, 2014 by Nicholas Chennault. 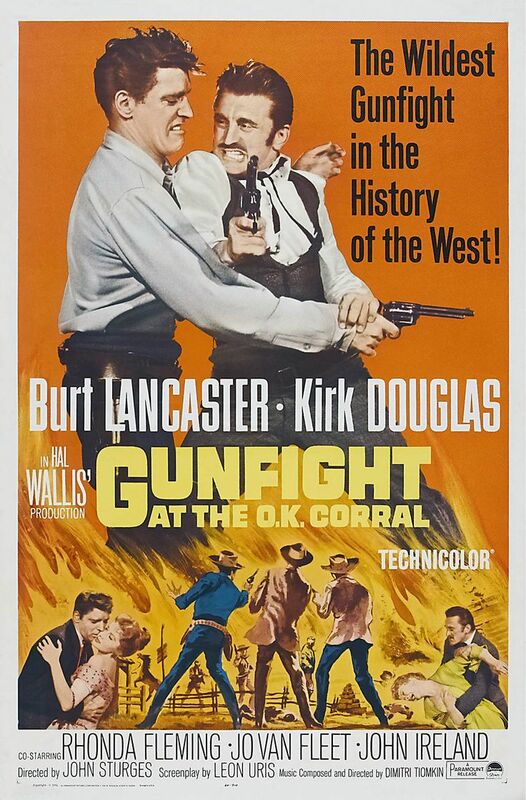 This is from director John Sturges’ early period; he made several very good westerns in the 1950s. His major period was thought to be a little later, in the 1960s with larger-scale movies (The Magnificent Seven, The Hallelujah Trail, The Great Escape). But with Escape from Fort Bravo, Bad Day at Black Rock, Last Train from Gun Hill and others, his work is worth seeking out. Robert Taylor was usually kind of a wooden performer, but that stoic quality can work okay in westerns, of which he made several in the 1950s. 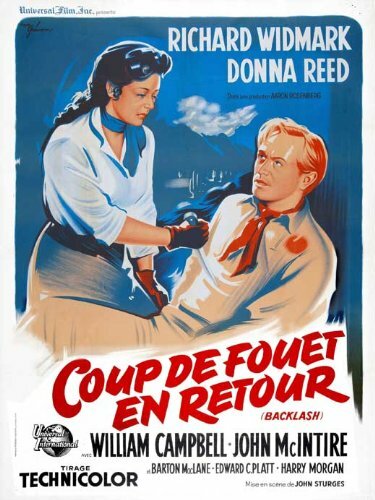 The real star of this modest western (shot at Lone Pine in Owens Valley) is Richard Widmark as Clint Hollister, a near-psychotic badman with whom Taylor has a past. 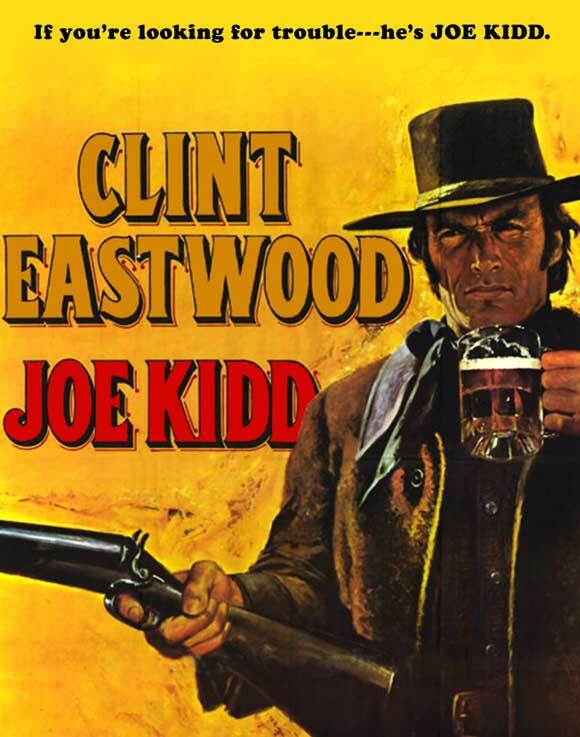 Jake Wade (Taylor) is now a city marshal of a small town in New Mexico, but he springs Hollister from jail to save him from hanging because Hollister once did the same for him when they ran in the same outlaw gang. The completely amoral (or even immoral) Hollister then repays him by abducting Wade and his fiancée Peggy (Patricia Owens). It turns out that when Jake left the gang more than a year previously, he took the loot from their most recent robbery. Now Hollister wants it, and he wants to kill Jake, too. The plots works itself out in the ghost town where Wade had buried the money in the cemetery, with a raid by Comanches and, ultimately (inevitably), a shootout between Wade and Hollister. Widmark is excellent as the relentlessly nasty Hollister. 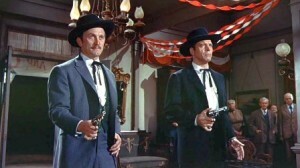 Notable supporting characters include Robert Middleton as Otero, and Henry Silva and DeForest Kelly (later of Star Trek) as other members of Widmark’s gang. 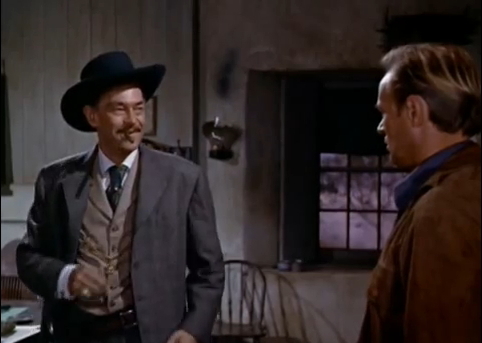 Silva shows up again as Chink, an evil henchman of Richard Boone in The Tall T, also made about this time, and as a Mexican Indian outlaw in The Bravados. He often has an ethnic edge of some kind. This is very watchable. In color, with Wade wearing Taylor’s usual black. See also Saddle the Wind, made with Taylor about the same time. 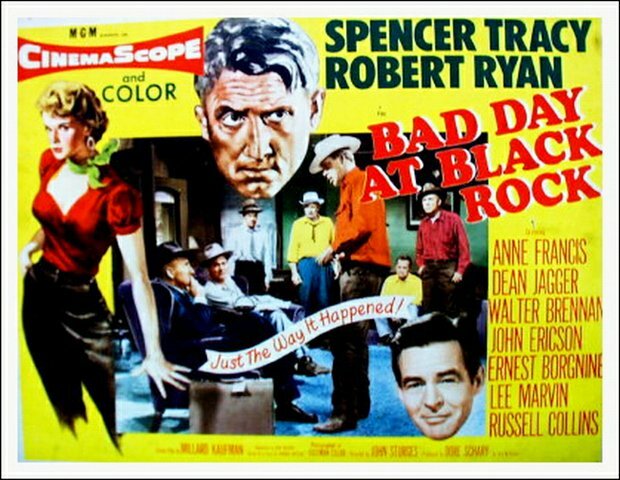 This entry was posted in Westerns Worth Watching and tagged John Sturges, Richard Widmark, Robert Taylor, Westerns Noir on January 21, 2014 by Nicholas Chennault. 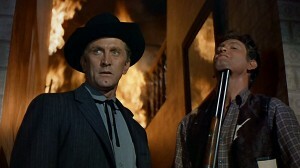 Matt Morgan (Kirk Douglas) is the town marshal in Pauley, married to a Cherokee woman. His wife is raped and murdered by a couple of young men passing through, and Morgan recovers their horses. 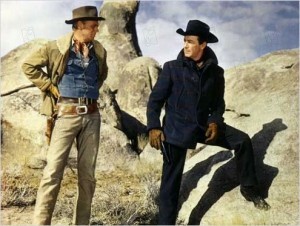 He recognizes the saddle on one as belonging to an old friend in Gun Hill, cattle baron Craig Belden (Anthony Quinn). It was his son Rick (Earl Holliman) who was using his saddle and committed the crime. Old friends Craig Belden (Anthony Quinn) and Matt Morgan (Kirk Douglas) talk about painful things. On his way to Gun Hill on the train, Morgan meets Linda (Carolyn Jones), a saloon girl and Belden mistress recently emerged from the hospital after a beating from Belden pere and now returning to Gun Hill. Gun Hill is a corrupt place, completely controlled by Belden. Morgan confronts Belden, who denies any participation by his son in the death of Morgan’s wife. But Morgan captures Rick and holes up in the Harper House hotel, where he is besieged by Beldon’s men. With some help from Linda, Morgan gets out to try to make it with Rick to the last train out of Gun Hill at 9:20 p.m. At the last minute, Rick’s partner in crime, Lee Smithers (Brian Hutton), tries to shoot it out with Morgan and kills Rick instead. Morgan gets Smithers and now has nobody to haul back to Pauley. He and Belden shoot it out, at Belden’s insistence. 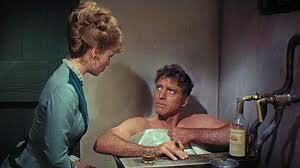 With the town against him, Matt Morgan (Kirk Douglas) holds Rick Belden (Earl Holliman) prisoner. The bones of the plot may sound fairly pedestrian, but it’s better than that. It’s a well-put-together John Sturges western from the end of his early period. Douglas gives a good performance; he’s obviously in good shape from the way he’s able to carry a supposedly unconscious Earl Holliman (not a small person) over his shoulder for an extended period on screen without showing any strain or becoming lopsided. His anguish at the death of his wife is believable, as is his determination to uphold the law and not take it into his own hands—one of the two central conflicts of the movie. Anthony Quinn is very good, too, in a character reminiscent of the one he plays in Warlock. Jones and Holliman are good in different ways, in limited parts. Reminiscent of the plot in 3:10 to Yuma in terms of trying to catch a train against armed resistance. In color. Music by Dimitri Tiomkin, cinematography by Charles Lang, Jr. The screenwriter was said to have been the blacklisted Dalton Trumbo. 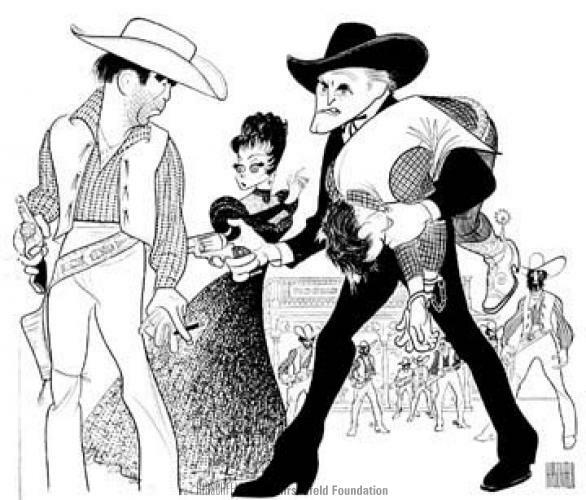 An Al Hirschfeld caricature, 1959. 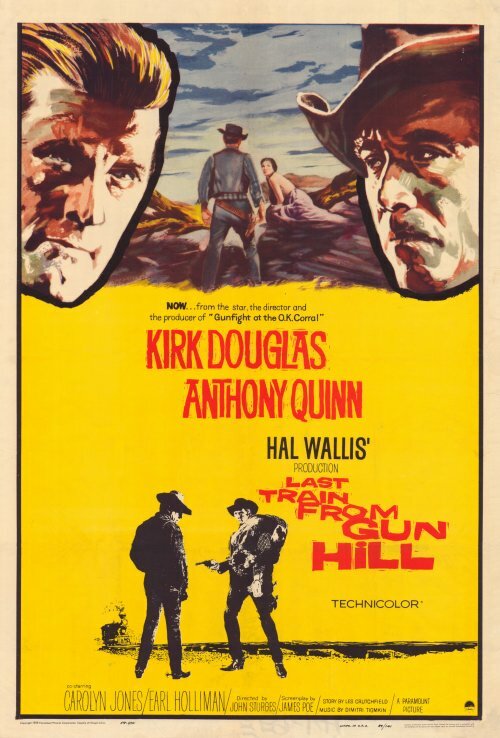 This entry was posted in Westerns Worth Watching and tagged Anthony Quinn, John Sturges, Kirk Douglas, Manhunts, Trains on December 19, 2013 by Nicholas Chennault. 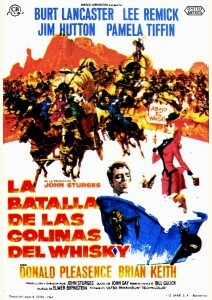 One of the best of the early John Sturges westerns. 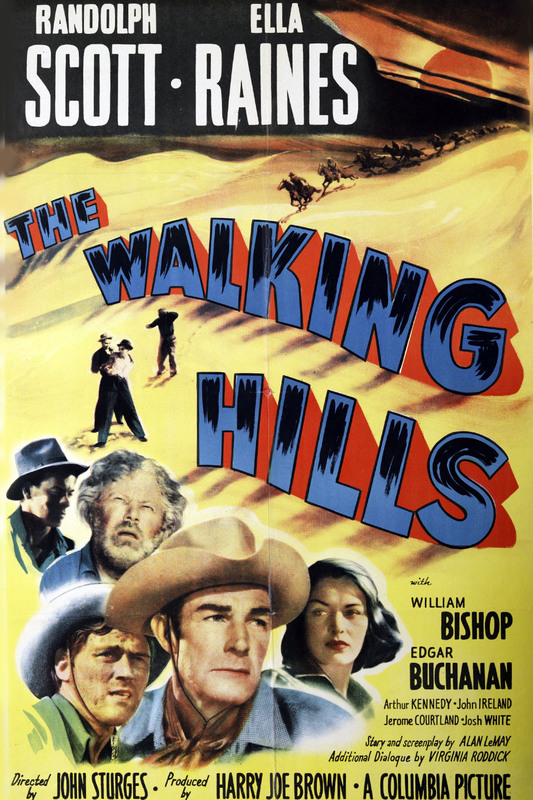 Filmed in Death Valley and New Mexico, Sturges is obviously playing visually with the stunning desert landscapes throughout the movie. The movie makes good use of color, if you’re watching a clear print. Apparently there are problems with some DVDs. Cinematography is by Robert Surtees. The sullen Confederate captives are led by John Forsyth (center). Eleanor Parker shows up as Carla Forester, an elegant Texas friend of the post commandant’s daughter (Polly Bergen) who’s getting married, and also the film’s principal romantic interest. In fact, she’s there to set up the Confederate escape. While doing so, she plays the hardened Roper, who falls in love with her. She is more a Howard Hawksian female than a John Ford one—one who comes close to the edges of propriety in her relationship with Roper while she’s playing him. The escape takes place, and Carla joins the escapees. Roper is ordered to go after them, and the Apaches are after them all. Roper does capture them, and they start to fight their way back to the fort. 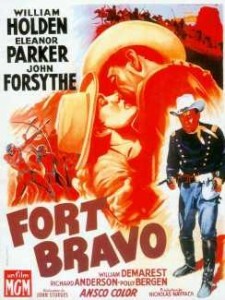 The fight back is desperate; this is one of those cavalry movies (like, for example, Fort Apache) that depicts the Indians as good tacticians. Sultry Confederate spy Carla Forester (Eleanor Parker) plays Lt. Roper (William Holden) as he falls for her. 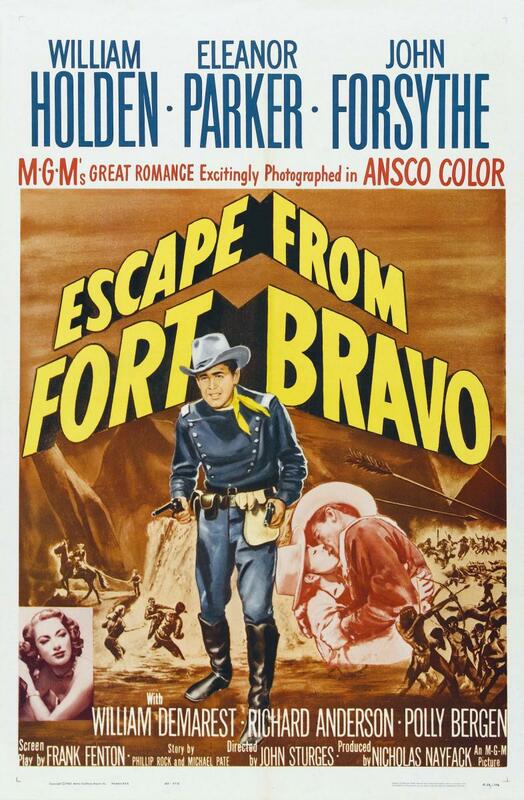 Escape from Fort Bravo belongs to that small category of cavalry westerns, along with Two Flags West and Major Dundee, that has Yankees and Rebs fighting side by side against the Indians. The supporting cast is good, especially crusty William Demarest as the oldest Confederate. Richard Anderson is decent as Lt. Beecher, a young Union junior officer. John Forsyth is elusive as the Confederate commander, who has his own romantic interest in Carla. 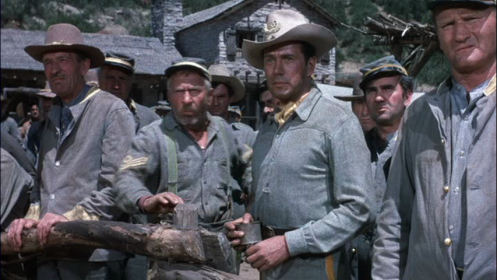 Lt. Roper (William Holden) faces a hopeless situation, vastly outnumbered by Apaches while trapped in the desert. The film is not without weaknesses: Eleanor Parker seems way too glitzy in dress and makeup for (a) the 19th century and especially for (b) a frontier post. She also doesn’t seem very Texan. The ending is abrupt and not entirely convincing, with the Apaches taking care of some of the difficult decisions. It would be good to see at least a little of how Roper and Carla work things out instead of just watching them ride into the sunset with Carla’s betrayal unresolved. Maybe a little more backstory on Carla would be interesting. 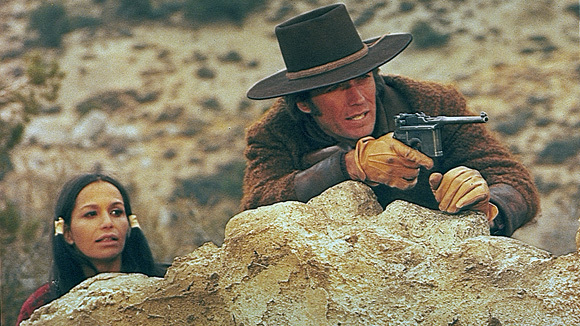 But this is a good, watchable western. William Holden is the center of the movie and his flinty personality and determination make it work. 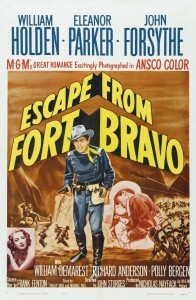 The film came out the same year that Holden won the Best Actor Oscar for his performance in Billy Wilder’s Stalag 17. He’s equally good here. 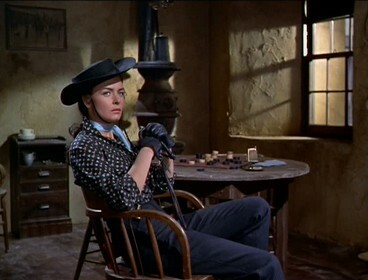 Eleanor Parker didn’t show up in westerns much. If you’d care for another look at her, this time in a colonial-period western, she plays an aw-shucks-type backwoods female who is after mountain man Robert Taylor in Many Rivers to Cross (1955). This entry was posted in Westerns Worth Watching and tagged Cavalry Westerns, Civil War, John Sturges, Native Americans (Indians), William Holden on November 10, 2013 by Nicholas Chennault. Perhaps the best movie set in the modern west (but see Lone Star and No Country for Old Men), a claustrophobic noir-inflected story that takes place in a tiny town in the Arizona desert. The movie begins with an interesting opening shot of a train crossing the desert. One-armed John J. Macreedy (Spencer Tracy) gets off the train in Black Rock in 1945 in a dark suit, the first time the train’s actually stopped there in four years. World War II is just over, but rationing and other strictures persist. None of the town’s suspicious residents want him there, as he tries to locate a local Japanese farmer, Mr. Komoko. The mysterious stranger arrives in town. A couple of local cowboy-thugs, Coley Trimble (Ernest Borgnine) and Hector David (Lee Marvin), try to intimidate Macreedy, who bears them with patience and an even temper. 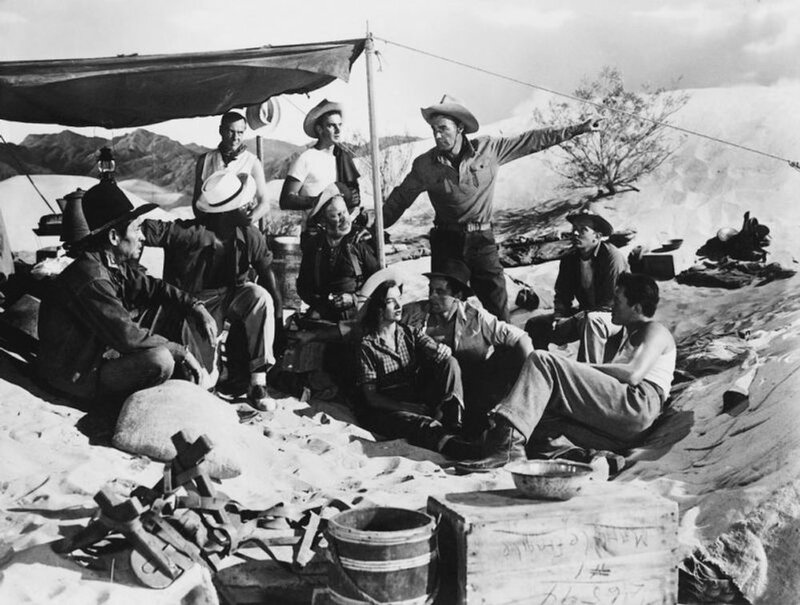 Local rancher-boss Reno Smith (Robert Ryan) suggests that Komoko was sent off to an internment camp shortly after Pearl Harbor, and only three months after he arrived at Black Rock. Macreedy visits Adobe Flats, where the Komoko farm was; he finds a burned house, a deep well and what may be a grave. On the way back, Coley tries to drive him off the road, but Macreedy makes it back to Black Rock. Coley then tries to pick a fight in a diner, only to find that Macreedy knows judo and takes him out using only one arm. It becomes clearer that Smith and his people killed Komoko, and they’re probably going to kill Macreedy, too. Macreedy is a veteran who lost his arm in Italy; Komoko’s son was killed saving his life, and he wants to give the old man his son’s medal. 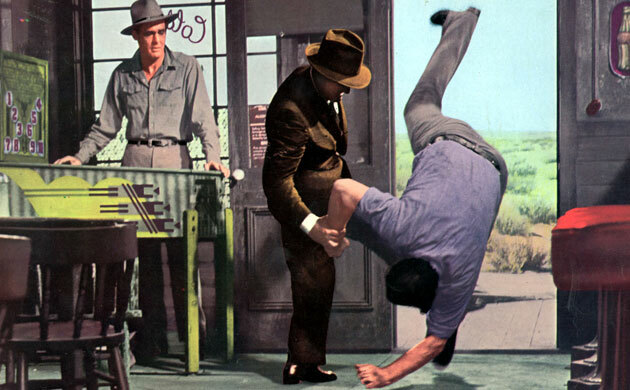 The drunken sheriff Tim Horn (Dean Jagger) and undertaker Doc Velie (Walter Brennan) try ineffectively to help him. Finally, young local hotel clerk Pete Wirth (a James Dean-esque John Ericson), plagued with guilt over his minor role in Komoko’s death, recruits his sister Liz (Anne Francis) to take Macreedy out of town in her jeep. She betrays Macreedy to Smith, who kills her anyway. In a shootout with no gun, Macreedy improvises a Molotov cocktail and sets Smith afire. Having brought in the state police to Black Rock, he then catches the train out of town. A superb cast cast, although Tracy seems old for a recent veteran, and some excellent writing in the screenplay by Millard Kaufman. Tightly directed, the film comes in at 81 minutes. Tracy was nominated for Best Actor. 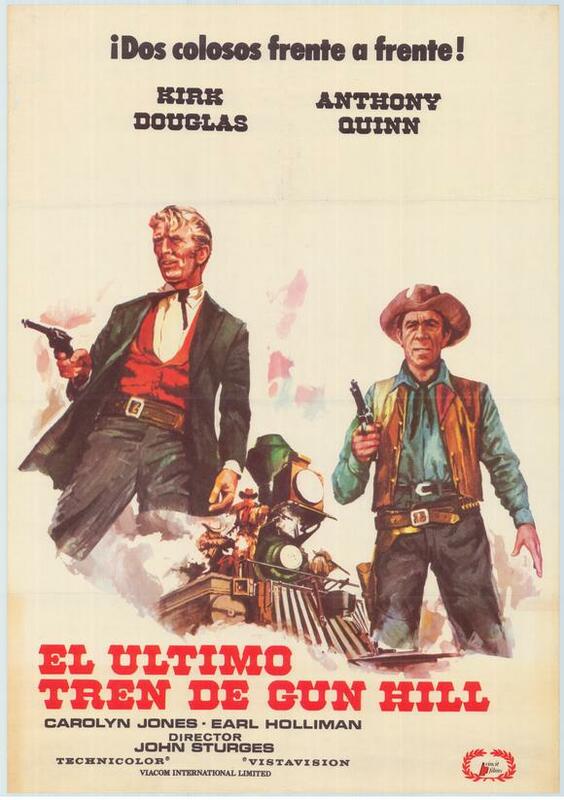 This was part of a good run for director Sturges in the 1950s, along with Escape from Fort Bravo, Last Train from Gun Hill and Gunfight at the OK Corral, before he got into his larger-scale action films of the 1960s. Music was by a young Andre Previn. 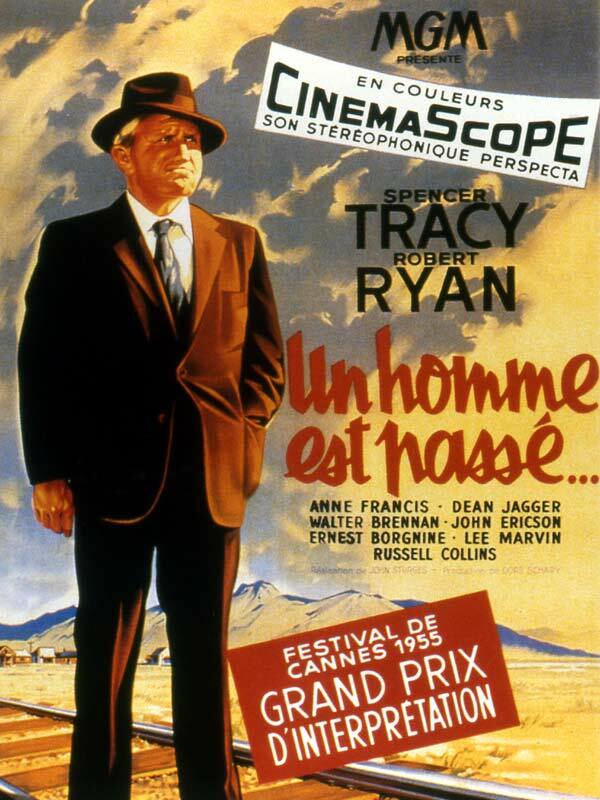 This entry was posted in Westerns Worth Watching and tagged Ernest Borgnine, John Sturges, Modern West, Robert Ryan, Spencer Tracy, The Mysterious Stranger, Walter Brennan, Westerns Noir on November 2, 2013 by Nicholas Chennault. This is the first and bigger-budgeted (and not necessarily the better) of two effective retellings of the story of Wyatt Earp in Tombstone directed by John Sturges. A decade later he’d do it again with a lower-wattage cast in a version that told the story better. This version owes something to My Darling Clementine, and it’s not much closer to the facts than John Ford’s classic was. 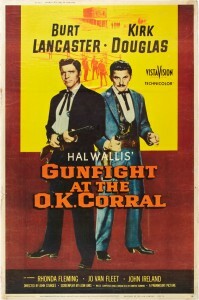 The gunfight itself is the end, rather than the middle, of the story as shown here. 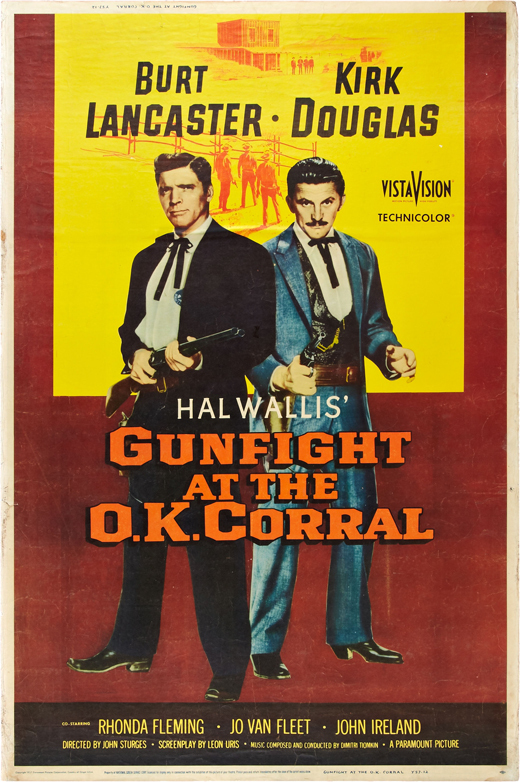 Two Hollywood giants of their day, Burt Lancaster and Kirk Douglas, play Wyatt and Doc Holliday—the second of seven films the two made together. Douglas, although an excellent actor here, is obviously from the Victor Mature school of robust tuberculars, very different physically from the spindly homicidal dentist of history. Rhonda Fleming is lady gambler Laura Denbow, a romantic interest for Earp in Dodge City, although she refuses to follow him to Tombstone and actually isn’t very necessary to the proceedings. Jo Van Fleet is Kate Fisher, Doc’s not-very-faithful prostitute girlfriend, obviously based on Big Nose Kate Elder. Dennis Hopper is good as a conflicted young Billy Clanton, but Lyle Bettger isn’t terribly memorable as Ike. 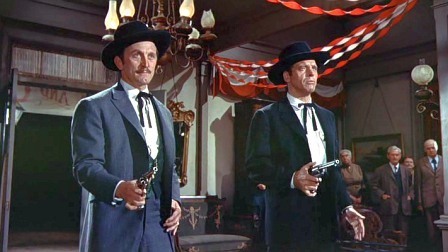 Doc (Kirk Douglas) and Wyatt (Burt Lancaster) join forces against Shanghai Pierce and Ringo in Dodge City. The gunfight, like that in Clementine, is nothing like what actually happened. In addition to all the choreography, it shows Ike and Finn Clanton getting killed, and ultimately Billy, too. In fact, Ike ran away from the fight and survived intact, and Finn wasn’t there. Doc shoots down Ringo (well-played by John Ireland), but Ringo wasn’t there either. As with Clementine, the action is precipitated by a Clanton killing of the youngest Earp brother, James (Martin Milner). In fact, James was the oldest Earp brother and was not involved in the events in Arizona at all. The actual gunfight lasted a mere 30 seconds, resulting in three dead men after an exchange of 34 bullets. In this adaptation, the movie gunfight took four days to film and produced an on-screen bloodbath that lasted five minutes. And there’s nothing about the subsequent murder of Morgan or the maiming of Virgil Earp, or Wyatt’s vendetta ride. Like most versions from this era, the story steers clear of Wyatt’s irregularities in his relationships with women. This movie works by itself as a story, as long as you’re not remembering the real story too much. This also makes Earp’s role as a Dodge City lawman more important than it was. As a cinematic matter, a nice touch is the montage of shots of concerned women just before the gunfight: Ma Clanton, worrying about her errant sons, especially young Billy; Allie Earp, Virgil’s wife; and the faithless Kate Elder. Heading for the corral with a low camera angle–clearly not a social call. An interesting comparison is with Sturges’ second version, Hour of the Gun, which features James Garner in his grim mode as Wyatt and Jason Robards as a sardonic Doc—not as lustrous a cast, but it works better. Much of this film was shot at the famous Old Tucson facility, not far from the real Tombstone. 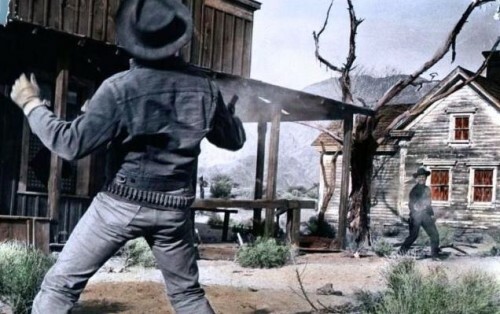 However, its “town street” set was used surprisingly as Fort Griffin, Texas, in the opening reels, while later Tombstone street scenes were shot in southern California, on the same Paramount Ranch set that was later used as Virginia City, Nevada, on TV’s “Bonanza” (1959). The theme song is sung by Frankie Laine, who had a voice made for western themes. Excellent score by Dimitri Tiomkin; cinematography by Charles Lang. The co-writer on this was apparently Leon Uris, author of the best-selling novels Exodus and Battle Cry. 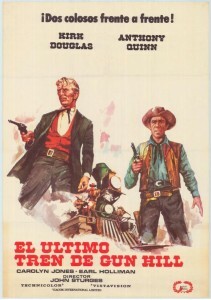 This entry was posted in Westerns Worth Watching and tagged Burt Lancaster, John Ireland, John Sturges, Kirk Douglas, Wyatt Earp on October 16, 2013 by Nicholas Chennault. 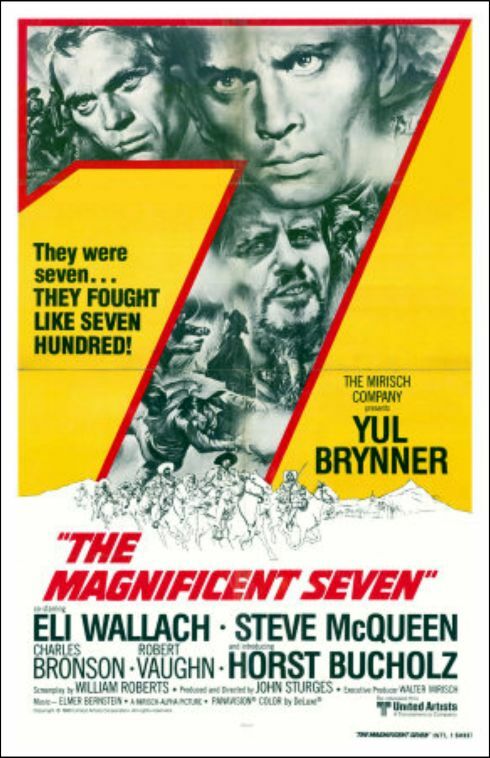 The exotic Yul Brynner seems an odd choice as the star of a western, but he’s become one of the iconic figures in the history of westerns because of his role as Chris Adams, leader of the seven in this relocated remake of Akira Kurosawa’s marvelous The Seven Samurai. 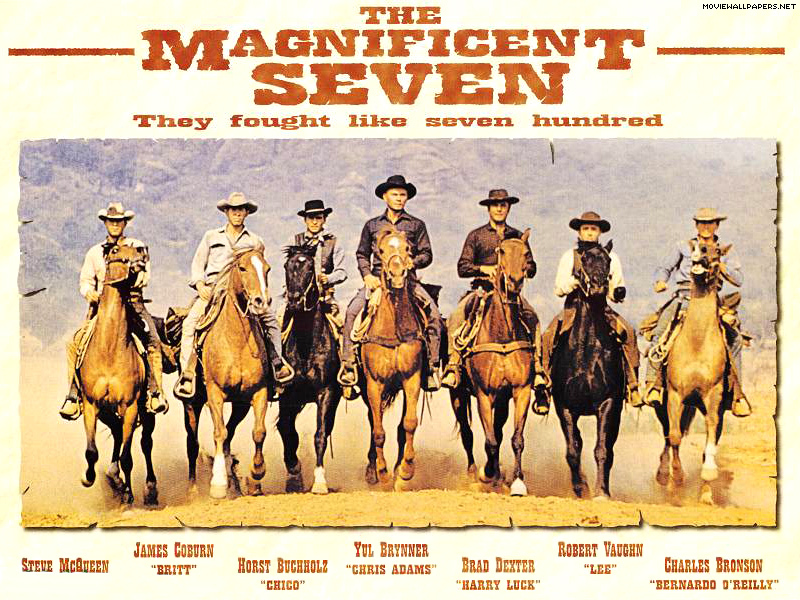 John Sturges’ talent for directing large-scale action was never in better form, and a number of elements combined to make this one of the most memorable westerns of the 1960s—a period that represents the apex of a certain kind of Hollywood western. The movie opens in a southwestern town with a dead Indian, whom prejudiced locals won’t allow to be buried in the local Boot Hill. A newcomer, Chris Adams (Brynner) volunteers for the dangerous job of driving the hearse to the cemetery, and unemployed cowboy Vin (Steve McQueen) rides shotgun. They make it up the hill, only to be faced at the cemetery by a small mob of armed and angry objectors, whom they handle with ease. Chris (Yul Brynner) and Vin (Steve McQueen) ride to Boot Hill. Among those impressed are three town fathers of a Mexican village plagued by bandits. They’re looking for help in ridding themselves of Calvera (Eli Wallach in his Mexican bandit chieftain mode) and his band of 30 or so banditos, who prey on the village regularly and kill any one there who shows signs of resisting. Better employment is hard to come by, and Chris assembles a team of six, starting with himself and Vin. 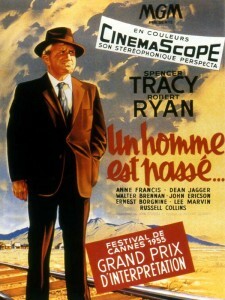 They include Harry Luck (Brad Dexter), an old acquaintance of Chris’s who refers to him (not entirely convincingly) as “You old Cajun”; Bernardo O’Reilly (Charles Bronson); Lee (Robert Vaughan), a smooth but high-strung gunslinger now on the run himself; and Britt (James Coburn), a taciturn, knife-throwing cowboy. 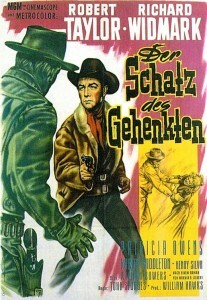 The final member of the group is Chico (Horst Buchholz), a young Mexican would-be gunfighter initially rejected by Chris. But as the band goes south into Mexico, Chico follows and is eventually accepted as one of them. The villagers have considerable misgivings about their new defenders. But as they prepare for the return of Calvera, Chris and his band teach the villagers some rudiments of self-defense and begin to form relationships. Bernardo, for example, becomes a favorite of the village children, and there are a few romantic attachments that develop with female villagers, notably for Chico. Cold gunfighter Lee has nightmares, and, after a drinking bout, confesses his fears to a couple of the villagers. Calvera and his bandits return, and initially they are easily driven away by the unexpected resistance. But they return yet again and Calvera tries to understand what drives these Americans who are now leading the resistance to him. His native humor and ruthlessness both show through. And there is the final battle, which four of the seven do not survive. The action sequences are extremely well directed and edited. As Chris and Vin leave the village at the end, Chris mutters the bottom line on all the killing: “The old man was right. Only the farmers won. We lost. We always lose.” But at least he isn’t dead. The movie’s most memorable line might be Calvera’s: “If God had not wanted them sheared, He would not have made them sheep.” A few lines seem a little anachronistic, like Vin’s reference to a man falling off a ten-story building. There are small touches that work very well, and some that raise questions. When Vin is loading a shotgun and shakes each shell before popping it in the shotgun, and then tells Brynner, “Let ‘er buck,” that seems authentic. In fact, McQueen and Brynner did not get along particularly well, and Vin’s sequence of mannerisms are McQueen’s way of stealing the scene against Brynner’s gravity. The Mexican villagers seem unusually well-laundered, though—lots of bright whites in a very dusty setting. * And one wonders why McQueen’s character Vin wears chaps so much in town, where they’re not necessary. You’d think they’d be too hot and cumbersome in what seems to be a very warm climate. 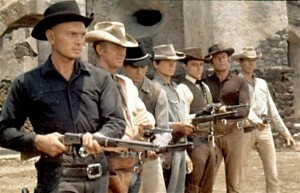 Brynner and Buchholz as actors don’t exactly fit the backstories of their characters. But it all works surprisingly well notwithstanding those quibbles. The seven defending the town from Calvera’s men. One of its elements may be the best of its kind in any western: Elmer Bernstein’s score, especially the theme. Bernstein was the quintessential movie composer of his time; he worked quickly, and in a broad variety of genres. He scored hundreds of movies, and this may be his most memorable music. The cinematography of Charles Lang, Jr. is excellent, too. McQueen, Coburn and Bronson would work with Sturges again in The Great Escape, and this film would spawn three sequels—none remotely approaching this first in the series for quality and watchability. Decades later (1998-2000) it would even be a short-lived television series. And a new cinematic remake is currently in production and scheduled for release in late 2016, with Antoine Fuqua directing and Denzel Washington in the Yul Brynner role. *The well-laundered whites of the peasants were apparently one result of Mexican authorities not liking the depiction of Mexican nationals in 1954’s Vera Cruz, also filmed in Mexico. 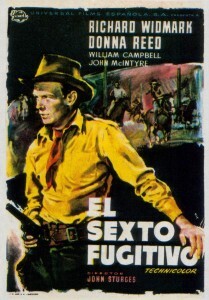 For a period of several years thereafter, they were much more vigilant in policing the way Mexicans were shown in American films shot in Mexico. 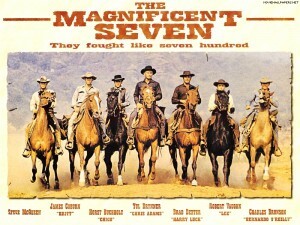 So the villagers in The Magnificent Seven were never dirty in their white peasant clothing. 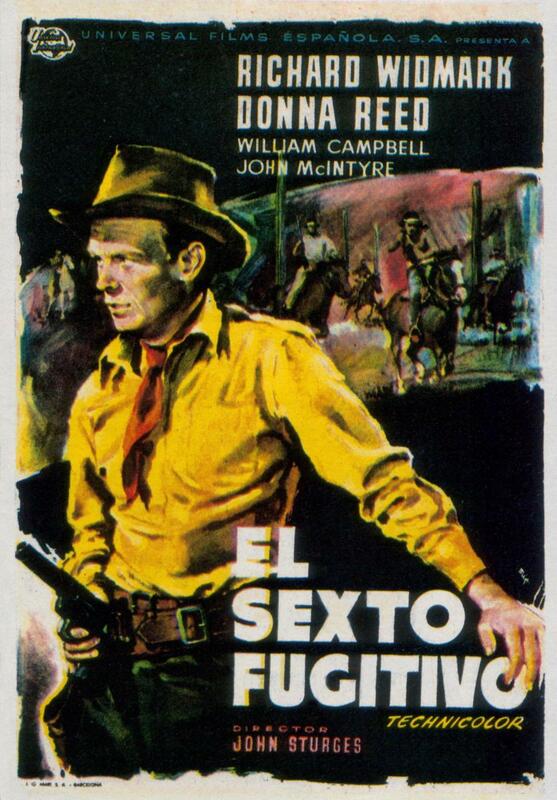 This entry was posted in 55 Greatest Westerns and tagged Adventures in Mexico, John Sturges, Steve McQueen, Yul Brynner on September 9, 2013 by Nicholas Chennault. 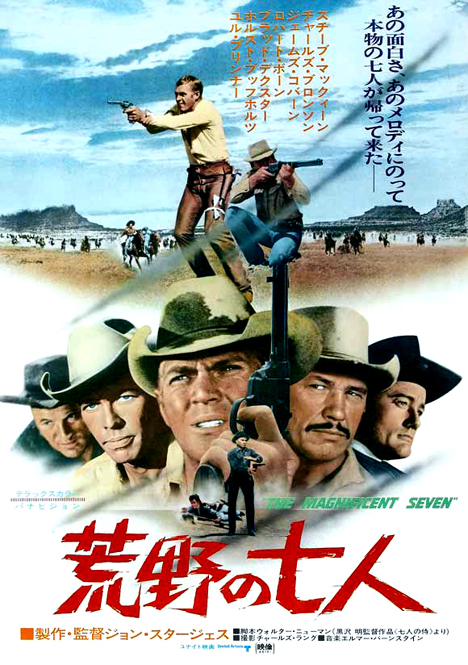 Director John Sturges was good with large-scale action material in 1960s films like The Magnificent Seven and The Great Escape. 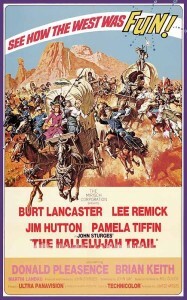 Although lighter in emotional content than those epics, The Hallelujah Trail was a similarly large-scale production under Sturges’ capable direction. 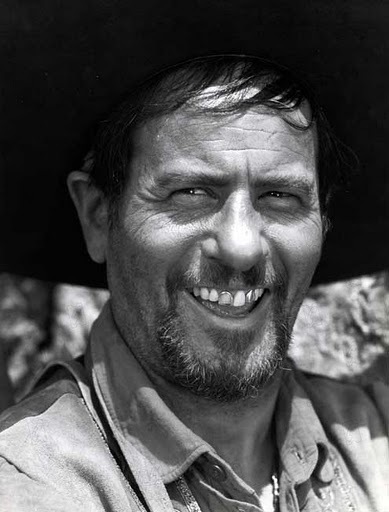 He had also demonstrated a high degree of skill with smaller-scale 1950s westerns like Escape from Fort Bravo, The Law and Jake Wade, Last Train from Gun Hill and Gunfight at the OK Corral. The plot involves the coming together of several parties with disparate aims in the fall of 1867. 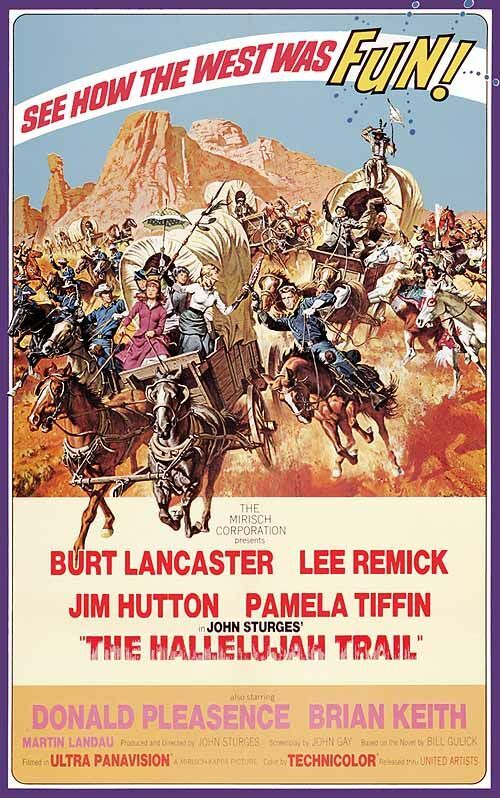 Frank Wallingham (Brian Keith) leads a wagon train of liquor bound from Julesburg to Denver, trying to make it before the anticipated long, harsh Rocky Mountain winter sets in. Oracle Jones (Donald Pleasance), an alcoholic seer, advises the Denver Citizens’ Militia, a group of miners who want to make sure that the booze gets through. Cora Templeton Massingale (Lee Remick) shepherds a group of temperance women who want to see that the liquor doesn’t arrive. Chiefs Five Barrels (Robert J. Wilke) and Walks-Stooped-Over (Martin Landau) head a band of Indians who are after the liquor, rifles or anything else they can get. And Col. Thaddeus Gearhart (Burt Lancaster) commands the cavalry protecting the liquor caravan from Indians and the temperance women from who knows what. Oracle Jones has a vision. The indications are that it will be a long, severe winter in Denver, and through a series of oversights and mishaps, the town is almost dry just before winter sets in. During the first half of the movie, the motivations and undertakings of the various parties are set up, with some character development, including a bit of interesting sexual tension between Col. Gearhart and Mrs. Massingale (a widow). At the start of the second half the parties converge in the middle of a large sandstorm where none of them can tell what’s going on. The “battle” in the sandstorm is expertly staged and edited, and entertainingly presented. A truce is eventually arranged, at which all parties (including aggrieved and activist Irish teamsters), agree to the deal brokered by Gearhart and then start out to subvert the agreement immediately. In the end, nobody really gets what he wants, and everybody sabotages everybody else. The liquor sinks into a bog, Mrs. Massingale hooks up with Gearhart, and the winter in Denver proves to be one of the mildest ever. Mrs. Massingale invades the colonel’s personal space. The cast is excellent, especially Lancaster and Remick in the central roles. Brian Keith’s Republican booze merchant gets a little tiresome, but that’s the way his role is written. Donald Pleasance is memorable as Oracle Jones, whose visions are fueled by alcohol. The Indians (clearly played by non-Indians) are very politically incorrect these days. And Jim Hutton and Pamela Tiffin are duly attractive as the young lovers with competing loyalties. Veteran character actor John Anderson has one of his best roles ever as Gearhart’s gruff, long-suffering sergeant. Character actor John Dehner provides excellent straight-faced voice-over narration from time to time, although he’s uncredited. Some will be put off by the comic alcoholic Indian stereotypes, played by white character actors (Robert Wilke, Martin Landau). But everybody in this movie is a stereotype: the stiff authoritarian cavalry commander, the clueless sergeant, the heedless and hormonally-driven young lovers, the alcoholic miners, the Irish teamsters, the humorless temperance women, the Republican businessman. The humor comes from the collision of all these stereotypes and their respective agendas, with no really serious casualties. Most of them (including the Indians) have to bend their agendas in some way, and the working out of those agendas provides the entertainment. Although the movie is a long one (it was shown with an intermission during its theatrical release), in the end it doesn’t have much substance. It’s just enjoyable light entertainment, with an excellent cast. It could have been more tightly edited, and it would have been just as enjoyable. The fine musical score is provided by Elmer Bernstein. Sturges himself didn’t think this was among his best work. 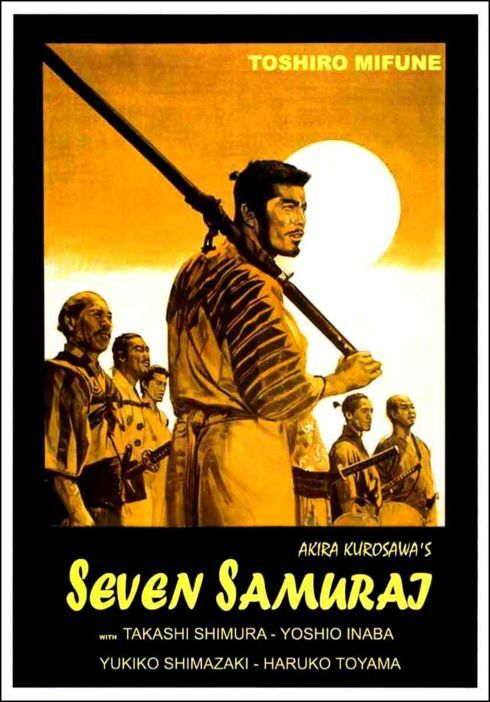 It was shot in 70mm widescreen format, and looks good on large modern televisions. For Burt Lancaster in another comedic western role, see him as mountain man Joe Bass in The Scalphunters (1968), with Ossie Davis. This entry was posted in 55 Greatest Westerns and tagged Burt Lancaster, Cavalry Movies, John Sturges, Native Americans (Indians), Western Comedies on September 4, 2013 by Nicholas Chennault.